One week until Valentine’s Day! And my birthday!! Time to get crackin’ on those gifts so that they make it in time for the big day. 2. I will never forget the first time I smelled Flowerbomb by Viktor & Rolf . It is such a unique scent, and one which smells nothing like a flower in my opinion. However, if you read the description you would never touch it… flat out wrong! 4. Cookies’ evil twin… macarons. Double yum. 5. Rach Parcell of Pink Peonies is living the blogger dream AND created her own jewelry line. I wish I could say I hated it but…. gimme everything. Also, she has an amazing marble ring. Gorgeous! 6. When we first met, Taylor thought I had a red watch. Either he is colorblind or had another girl in mind, but regardless – this one is the way to go! A timeless Tory Burch for the win. One month in to 2015 – how are your resolutions going?! It can be so hard to stay productive, especially in the cold months when all I really want to do is curl up by a fireplace and do absolutely NOTHING. Kabbage believes boosting productivity is a wise investment and offers fast online loans ranging in a variety of price points. I also have multiple ideas on how to be your most productive self! There are a few things which I have found help me stay productive. What are yours? 1 // What better way to stay on task than with a great watch you can wear every day? 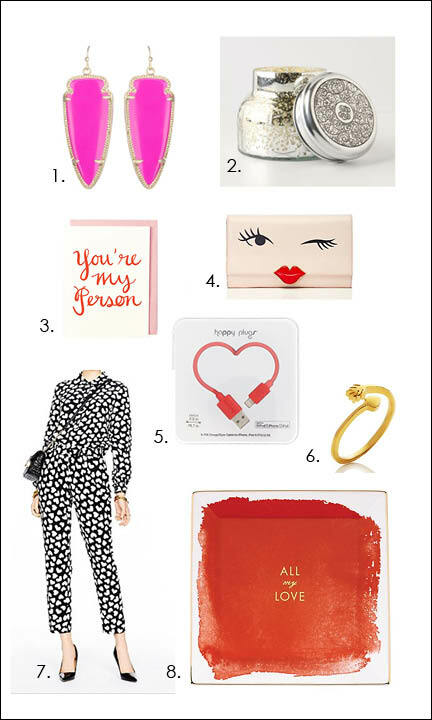 Grab this Kate Spade style here. 2 // I used to spend hours an insane amount of time standing in front of my closet, trying to put something, anything, together. Then, one summer I made the greatest discovery – Stylebook. I had spent years dreaming of a Cher (a la Clueless) style closet, which would help complete outfits based on the clothing you own. With this app, you can take photos or upload pictures from a website, of your own clothing and categorize each item. Then, you can pull together outfits and even plan ahead with a calendar. As someone who is anything but a morning person, this has saved me loads of time. I don’t plan outfits weekly, but I will drag together various pieces which I could see as an outfit. Then, I look to those styles for inspiration while I am getting ready. Truly a huge productivity booster in knocking out the rest of my to-do’s! 3 // It’s rare to meet someone who has set a New Year’s resolution without having one related to wellness. I was apprehensive about the Fit Bit at first. Would I wear it? Would I track my goals? My sleep? My nutrition? At work, I often find myself sitting for several hours. Until I started tracking my steps, I had no idea that I was only meeting about 30-40% of my daily movement goal! The Tory Burch Fit Bit is the perfect blend of style and functionality. I wear the bracelet every day, and love that it looks like a simple bangle. If I head to Barre class or hit the gym, I can simply remove the Fit Bit and pop it into a workout band. Tracking my sleep is another great new function to take advantage of and is making be a nicer bride…. or Britanzilla. 4 // How can one stay on top of their game if they don’t have a planner?! This awesome Brittany Fuson day planner was gifted to me at Christmas and it is fantastic. Not only is each page filled with fashion-forward prints, but it helps me stay sane in the most ridiculous of times. 5 // I am a creature of habit and one of those habits is making lists. There is something so calming about getting things off your mind and on paper. Recently, I read a book called “Getting Things Done,” which essentially speaks to methods of productivity. In the book, the author notes that even if you are a list maker, these lists can spiral out of control. (Shocker!) Unless you are able to bucket them into categories and then note the exact, bite-sized next action step – your list will keep rolling over and you may never be able to *gasp* fully cross off items. Point taken. 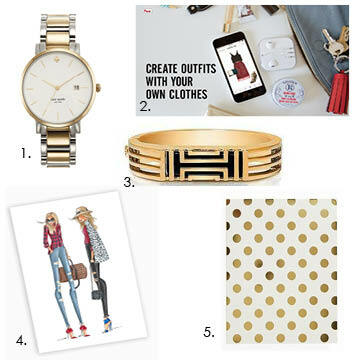 Capture all of your thoughts, to-do’s and goals with this gold polka-dotted beauty! Valentine’s Day has always been among my favorites. It immediately follows my birthday and seeing conversation hearts begin popping up in stores was always a fantastic sign! 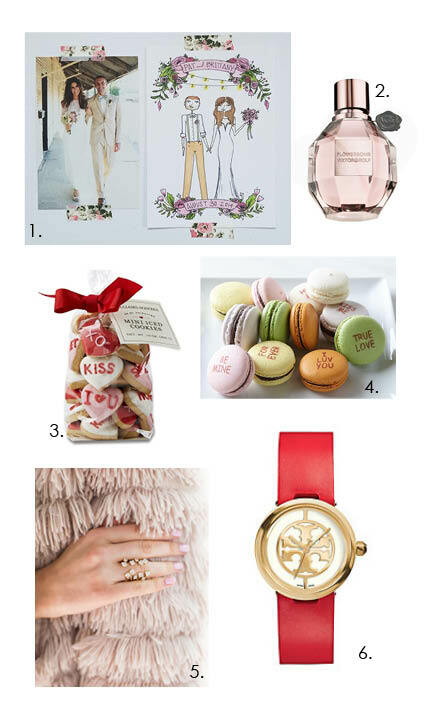 Among the other reasons I adore Valentine’s Day – pink and red are the best color combination, angels and arrows are the best symbols, and hello – cards filled with the best puns?! Count me in! Of course, I’m also a closeted hopeless romantic who grew up on 1940’s black and white films. I believed men should dance like Fred Astaire, sing like Bing Crosby, speak like Cary Grant and have the passion of Rhett Butler, I mean, Clark Gable. Let’s just say I had a rude awakening around 2003. Hey fellas – I didn’t forget about you! 1 // Pooping Penguins: Does this really need any explaining? 2 // Left Right Center: This is our new favorite at family game night – up the ante by playing for gift cards to your favorite restaurant. Never gets old! 3 // Fuzzy Face Picture Frame: His new favorite game to play at the office. 4 // Bacon Chocolate Chip Pancake Mix: Bacon. Chocolate. Pancakes. Mmmm. 5 // GI Joe Bottle Opener: A childhood favorite gets a modern twist. 6 // Cigars: I give cigars for special occasions only AND highly suggest throwing in some of these Reviver wipes as well for post-cigar stink. 7 // Portable charger: A need. Not a want. 9 // Scratch Offs: Who doesn’t get excited about scratch offs? I love gifting. It’s an incredible challenge to not just shop, but to find something really special/fun/unique for those on your Christmas list. Everyone seems to have different traditions when it comes to stockings – some get hygiene products (a lifetime supply or 40 years of razors, soap, shaving cream, deodorant, etc.) while others get gift cards. In my family, Santa sends a mixture. 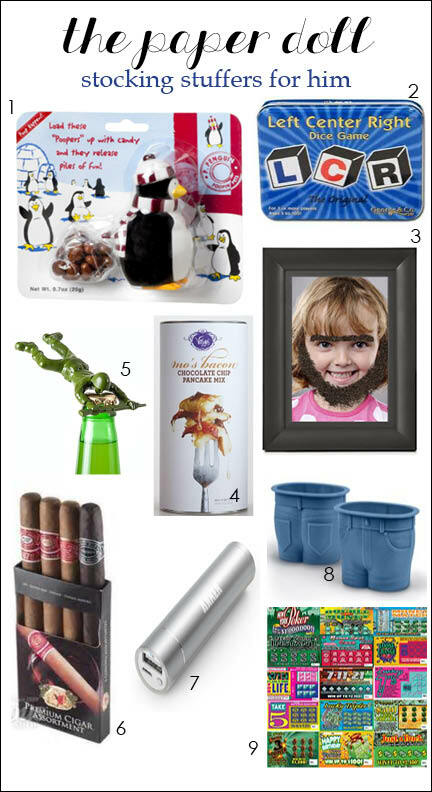 Stockings always include some hilarious things (think the pooping reindeer), a ridiculous amount of candy, some gadgety type things, socks…. it changes yearly. 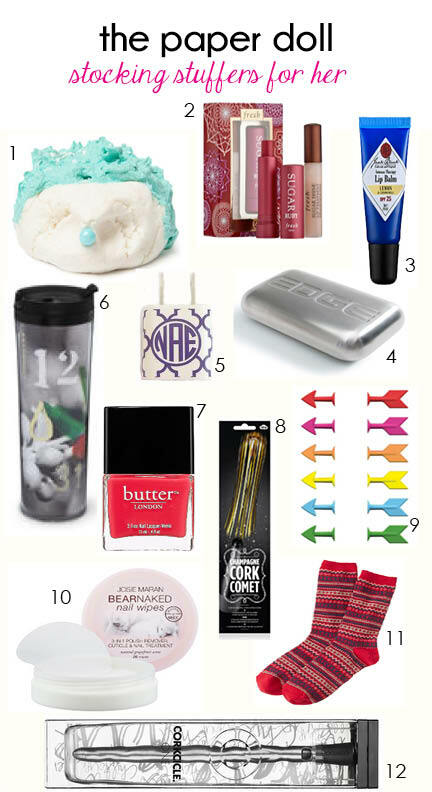 I’ve compiled a short list of fun stocking stuffer ideas – what does the big man bring to you?! 1 // Lush Christmas Hedgehog Bubble Bar: I’ve become a big bath person, and Lush’s bubble bars are the way to go. Break them up and one bar lasts multple baths. 2 // Fresh Sugar Sampler: Looking for a great tinted chapstick? Fresh makes the best, and the raspberry tone is ah-mazing. 3 // Jack Black Lemon Chamomile Chapstick: My absolutely favorite chapstick on the face of the planet. 4 // Metal Soap: Sometimes I completely avoid using garlic/onions all together because it takes days of multiple showers and hand washes to get the smell off my hands. Not anymore! 6 // Starbucks Tumbler: A double-walled tumbler made with recycled materials that gets you one grande brewed coffee every day for January 2015. Upgrade to the fancy one for $65 and get ANY seasonal drink daily. 7 // Butter London Nail Polish: Butter makes really amazing nail polish – not gloopy or runny. 8 // Cork Comet: I can already see this flying across the room at a New Year’s Eve party! 10 // Nail Wipes: Love to take these when I travel, or if I’m just simply over using cotton balls. 11 // Socks: A go-to stocking stuffer! 12 // Corkcicle: Wine not? Have you ever read The Five Love Languages book? I have always loved to give gifts, often as an act of service to thank someone for doing something special or to celebrate a big occasion. Even my friend Libby says that I am so talented when it comes to thoughtful tokens of appreciation (and maybe get a little too overzealous when receiving them too) that I should be a professional Gift Giver. 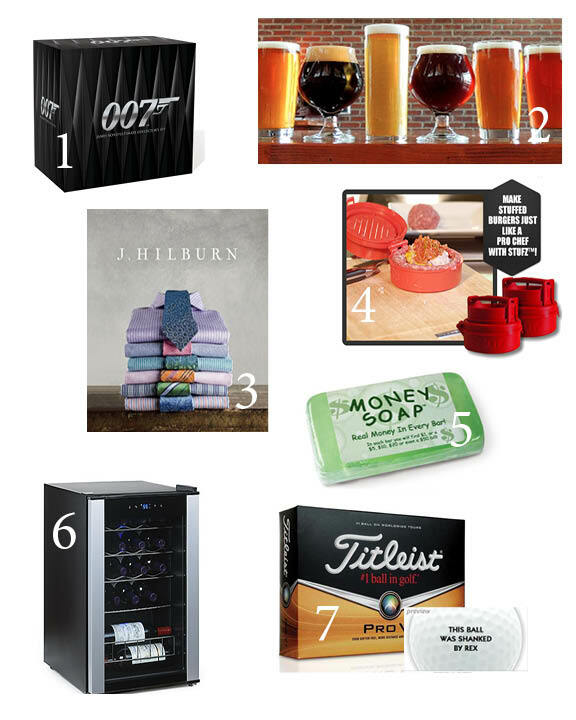 As a special gift to my readers, I’m bringing you a peek into what I consider to be excellent Father’s Day gifts – most are even Carlos approved! 1. James Bond Giftset – Do I even need to explain this? Whether he is more like Clark Griswold or Pierce Brosnan, he will appreciate the entire collection of Bond, James Bond. 2. Beer Brewing Class – For one Father’s Day, we sent my dad off to a beer brewing class – and he was hooked. In fact, he loved it so much, that he gets together with his buddies and brews beer all the time. It’s a fun hobby, and his beer is awesome! 3. J. Hilburn Custom Menswear – When a friend asked if T would be interested in custom designed and cut menswear, I knew he would love it, so I joined the team! (Shameless Plug!) The clothing includes custom suits and shirts, plus a huge collection of ready to wear ties, cufflinks, polos, jeans, etc. at the same price point as Nordstrom’s or Dillard’s, but with the quality of Armani. After taking 15 measurements to ensure a perfect fit, I will work with you and the stylish (or not so fashion savvy) man in your life, to select everything from the collar style to the fabric. No more puffy waists or tight collars! 4. Stufz – You know those As Seen on TV commercials? My parents love them. I went home and my dad whipped up a three cheese stuffed burger with this gadget, and people – it was delicious! Think of the endless possibilities and creativity involved in crafting the perfect burger. This is a winner! 5. Money Soap – I bought my dad and Taylor’s dad this fun soap for Christmas. My dad immediately cut into his and found $1. Taylor’s dad used the soap for nearly a year, and found – $1. I suppose sometimes patience does not pay off, but they both got a kick out of it! 6. Wine Fridge – Because – life! This is the gift that keeps on giving. Every wino needs a place to store their treasured wines, and Wine Enthusiast has an incredible selection. Add that to my wish list as well…. 7. Personalized Golf Balls – For the golfer with a sense of humor. We ordered these (exactly as pictured above) for Taylor’s dad, and he loved them. Sure, the guy is a scratch golfer – which made the golf balls that much more hilarious! What’s the best gift you have given dad? I’m always looking for new inspiration to take my gift game to the next level!